Many fruit trees can be ‘espaliered’ – or grown along wires or trellis to create a space saving tree or a specific effect. Popular throughout the times, the word espalier is French and derived from the Italian word spalliera, meaning “something to rest the shoulder against” and was originally the name of the actual trellis although is now the common term for this style of growing a fruit tree. Espaliering trees can be as easy or complicated as you like and often becomes a gardeners passion. There are many different forms of espaliering and each season allows the form to take greater shape. To start a basic espalier simply take your young (1-2 year old) fruit tree and prune away all but two even branches that may be lightly pulled down to the lowest wire and tied in the middle and end. You are training these branches to grow horizontally. 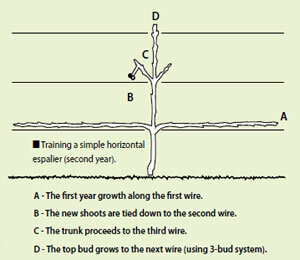 As the tree shoots more branches, continue four of them up to the next wire positioned about 15cm above the first wire and tie at the base of a bamboo stake. That will allow you to train the branches to grow vertically. And so on. For more information please visit our Help Guides section.